Around 575 BC, King Nebuchadnezzar II of Babylon constructed the eighth gate to the ancient city, the Ishtar Gate. Ancient Babylon was enclosed by tall walls that measured over forty one miles in length and today it is still debated how tall the walls would have been. It has been estimated that the walls stood 75 feet tall, and other have even described the walls as being 300 feet tall (Walls 2012). Because the walls are no longer standing it is of no real knowledge that we would be able to decipher just how tall the walls of Babylon stood. However, it is agreed that there were two walls surrounding the ancient city, with the Greek historian Herodotus claiming that a four-horse chariot could move between the two (Walls 2012). The Ishtar Gate was built in dedication to the Babylonian goddess Ishtar and stood approximately 38 feet tall (Garcia, 2013). It was constructed of mud bricks that were created from the clay taken from the river valley. Babylon was surrounded on one side by the Euphrates river, and as a result, Babylonians constructed most of their architecture with clay bricks (Harris 2012). The Ishtar Gate was constructed on the side with the river and was accessed by the Processional Way. The Processional Way crossed over the Euphrates River and was used in religious ceremonies. Each new year, those participating in the religious ceremony would carry statues that represented the gods over the Processional Way. This ceremony honored Marduk, the patron god of Babylon (Damon, 1993). The gate displays reliefs of lions, dragons, and bulls, each representing different gods and formed from brick. The lion represented the goddess Ishtar and could be found lining the walls of the Processional Way (Garcia, 2013). Today there is a portion of the gate that is standing in the Pergamon Museum in Berlin, Germany (King, 2008). Between 1928 and 1930, a representational reconstruction was built and transferred to the Pergamon Museum. It was created using the excavated remains of the gate. However, because of the size of the museum, they were not able to create an exact replica and the gate standing in the museum is smaller than the actual gate would have been. They only have the first gate on display, with the larger second piece in storage because of size restrictions. During my reconstruction of the Ishtar Gate, I used artistic renderings and the Pergamon reconstruction for inspiration. 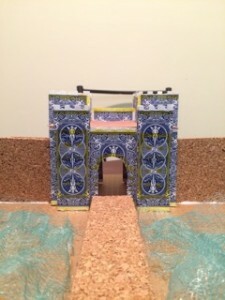 I began by constructing the front half of the gate with two large pillars and the gate archway. From my readings, I had determined that the second part of the gate would have been similar to the first, except it would have been larger. I constructed my gate using playing cards because they would provide a sturdy and bendable material. They also had an interesting, blue design that I believed would look nice. Because the material I used was already decorated and on a small scale, I did not show the reliefs of the dragons, lions, and bulls. If the reconstruction were done on a larger scale, it would be easier to show the animal reliefs. I cut, folded, and glued the cards into the shape of the reconstruction found at the Pergamon museum. After achieving the desired look I constructed the second part of the gate that would have been found on the inner wall surrounding the city. I created larger columns for the second part and attached the two pieces together. After reaching completion of the large pieces of the gate I was able to measure and cut sections of brown paper for the roof of the gate and large columns. After finishing my gate I attached it to the desired base and created a path to the gate. I created a path to represent the Processional Way over the Euphrates River. I wanted the gate to be the main focus and effort of my reconstruction so I did not create an overly designed representation of the Processional Way. I also used tulle to represent the Euphrates River, which the Processional Way crossed over. Reconstructions are important in art and history because it gives us a glimpse of what an object would have looked like when it was created. When an object is discovered or located it is not usually whole and complete. Reconstructing an object allows further study of a culture and society when we might not get a complete understanding of otherwise. The Ishtar Gate would never have been as appreciated or studied as it is today had there not been a reconstruction. It is one thing for an artist to draw what an object might have looked like, but when an object such as the gate is reconstructed, it allows people to get a better understanding of the size, shape, look, and importance of the object. As I was reconstructing the gate, I learned more about it and now have a better understanding of the city of Babylon, the gate, and the religious importance of the gate and religious ceremonies. Damon, Duane. 1993. “The great restorer: Nebuchadnezzar and Babylon.” Calliope 4, no. 1: 34. MasterFILE Premier, EBSCOhost (accessed April 18, 2015). Garcia, Brittany. “Ishtar Gate,” Ancient History Encyclopedia. Last modified August 23, 2013.
video, 6:49. April 2, 2012. Premier, EBSCOhost (accessed April 18, 2015). “Walls of Babylon,” Global Security. Last modified March 26, 2012. Accessed April 18, 2015. Nearly 2,500 years ago, the Parthenon was built. It served as a temple to the goddess Athena and had since been used as a church, mosque, and even storage for gunpowder. The Ottomans used the Parthenon for gunpowder storage in 1687 and caused an explosion that greatly damaged the ceiling (Parthenon 2008). When the Ottomans ruled Athens they had no interest in the architecture or art that surrounded them. The damage from the explosion left many pieces of art just laying on the ground surrounding the Parthenon. It wasn’t until 1801 that the majority of the pieces of art were moved. From 1801 to 1805 a man by the title Lord Elgin traveled to Athens and had a team remove large pieces of marble, statues, parts of the frieze, and other pieces of artwork. He took the art back to his home in Britain where he intended to keep it as a private collection. He had supposedly been given a permit from the Ottoman Sultan that allowed him to take whatever he pleased (McGuigan 2009). After a few years in Britain, the British government purchased the Elgin Marbles and they were placed in the British Museum (Parthenon Sculptures n.d.). Today the Greek governments are fighting for the return of the art to where they believe is their rightful home. They have even had a large $200 million museum, The Acropolis Museum, built so that they would have a place to house them (Kimmelman 2009). There is debate about whether the Elgin marbles should remain in Britain or return to Greece. In my opinion, they should be returned to Greece now that they have the facilities to ensure their protection. Given the situation in 1801, I do not think Lord Elgin was wrong in taking the art. I also think it is nice that the British Museum has been able to house these artifacts for so long. A great number of people have been able to appreciate artwork they might never have seen otherwise. However, now that Greece is able to house the artwork and they are fighting for its return, I believe it should be given to Greece. The British Museum has no rightful ownership in my opinion. They might have purchased them, but there is debate about the authenticity of the permit Lord Elgin possessed. Lord Elgin has been equated to a looter and theoretically stole the artwork from Greece. If you knowingly purchase a stolen car for example, it does not make the car yours. If you were taken to court the car would be taken away and given back to the rightful owner. The Greeks want to be able to reunite their artwork with their country. The art was created for the Parthenon and surrounding areas in Athens. While the British Museum has protected and housed the Elgin Marbles since the 19th century, it is time they were returned to their rightful country. Lord Elgin traveled to Athens with the intent to learn about the ancient art and returned with pieces of a culture and history. After housing the art for a few years the British government purchased these pieces and they have since been kept in the British Museum. Until recently with the construction of the Acropolis Museum, Greece has not had a proper facility to keep the artwork protected. However, now the country has the facilities and the desire to have a piece of their history restored and it would be in the best interest of the artwork if it were returned. Anonymous. The Parthenon’s Many Lives. 2008. PBS. Kimmelman, Michael. “Elgin Marble Argument in a New Light.” The New York Times. June 23, 2009. http://www.nytimes.com/2009/06/24/arts/design/24abroad.html? pagewanted=all&_r=0. McGuigan, Cathleen. “Romancing the Stones.” Newsweek. June 6, 2009. “Parthenon Sculptures.” British Museum. http://www.britishmuseum.org/about_us/news_and_press/statements/part henon_sculptures.aspx. The Minotaur was born from a mortal but he was not a man. The name stems from the Greek name “Minos” and the greek word for “bull.” The story of the Minotaur began with Minos. Minos claimed to have the support of the Gods on his side and believed he could ask them for anything. He prayed to Poseidon to send him a bull that he would sacrifice. Poseidon sent Minos a beautiful white bull and this proved that Minos was meant to be king. However, Minos sacrificed a different bull and kept the beautiful one to himself. This angered the god and as a punishment he caused the King’s wife, Pasiphae, to lust after the bull. Once Pasiphae was cursed, she recruited the help of Daedalus and Icarus to construct for her a wooden cow covered in cowhide to lure the bull to mate. The wooden cow was taken into the pasture with the bull and Pasiphae climbed inside. Pasiphae laid with the bull and became pregnant (Britanniae, 2013). When the baby was born King Minos learned of his wife’s infidelity. King Minos did not punish Pasiphae but enslaved Daedalus and Icarus for assisting her. The baby had the head and tail of a bull and the body of a man. Pasiphae was able to care for him while he was young, but once the Minotaur grew he could not be sustained on normal food. He began to eat humans and they were his only source of sustenance. Because of the danger that the Minotaur presented, Minos had Daedalus and Icarus build a labyrinth to keep him contained (Britanniae, 2013). While the Labyrinth was being constructed, King Minos found out that his only son, Androgeos, had been killed. He blamed the Athenians for the death of his son because it was believed that the King of Athens, Aegeus, devised his death. Minos harassed the Athenians until they agreed to sacrifice fourteen youth every nine years, half being men and half being women, to be fed to the Minotaur. Through harsh persuasion of the gods the Athenians were forced to submit to this sacrifice (Britanniae, 2013). Theseus, the son of King Aegeus, claimed that he could kill the Minotaur and volunteered to be sent to Crete. When Theseus arrived in Crete, King Minos’ daughter Ariadne fell in love with him. She devised a plan to help him kill the Minotaur and escape death. She provided him with a sword and a ball of yarn to be able to find his way back out of the labyrinth. Theseus succeeded in killing the Minotaur and escaping Crete. On his journey back to Athens he absentmindedly forgot to sail the white flag that he had agreed to fly if he was still alive. His father, King Aegaeus, believed him to be dead and threw himself into the sea in despair. When Theseus made it back to Athens he was crowned King (Britanniae, 2013). The mythological representation of the Minotaur provides us with a tale of monsters, traditional heroism, and kingship. While the Minotaur, King Minos, and Theseus only existed in mythology there has been belief that there is some historical representation in Knossos, an ancient town and site of the Palace of Minos (Vavouranakis, 213). The myth of the Minotaur is not solely about the myth of the beast. The ancient hero, Theseus, is most known for his destruction of the Minotaur. The Minoans were a real civilization and were named after the mythical King Minos. Today we recognize the Minoan civilization as having existed in Crete from around 3100 BC to 1450 BC (Browne, 109). 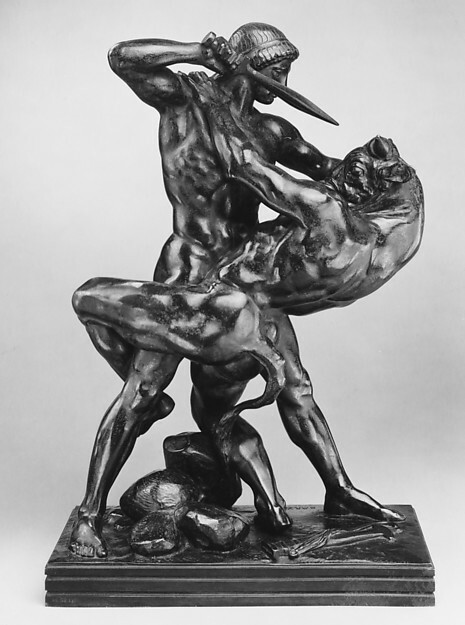 The image presented is of a sculpture titled “Theseus Slaying the Minotaur.” Here Theseus is shown overpowering the Minotaur who is struggling. Many historical art pieces depicting Theseus and the Minotaur are pictured similarly with the Minotaur being defeated. Theseus was known as a traditional heroic figure in mythology. This can show us the cultural representation of a hero during the ancient times. Theseus used his strength to overpower the Minotaur but he also used his intelligence and wits. Representation of a King in this aspect shows that the greeks honored strength, wisdom, and sacrifice. Theseus volunteered to save the lives of those who would be eaten. Britanniae, Brittany. “Minotaur,” Ancient History Encyclopedia. Last modified September 01, 2013. Text, EBSCOhost (accessed March 11, 2015).